I wouldn't do it if it were just me. My wife is a real Holiday "nut". She decorates the yard and driveway for the Holidays even though we never get any visitors. It's special because I enjoy it and would never make fun of her for doing it. She does the inside of the house too. We will celebrate Halloween, Thanksgiving, Christmas, Easter and any other excuse that comes up for her to decorate. 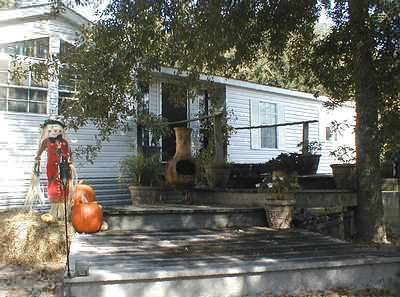 Here is the front stoop full of hay, scarecrow, Hibiscus and other flowers. I probably would have been putting christmas lights up today if it had not been for the winds storm we are having. We just got juice back on but I dont expect it to stay. (gusts as high as 65) I wanted to get the lights up early (dont have to turn them on) so I had decent weather to work in. Looks like I might as well wait now since we will have snow by tuesday they say. Been getting that wind too, as of late last night. Woke up this morning to a yard full of shingles. Lived here 37 years, and the first time shingles have blown off the house (re-roofed just 4 years ago this month). Whole shingles blew off. Not what I wanted to be doing tomorrow on a 7:12 pitch roof in 40° temp, but not a lot of choice as that rain/snow is expected here Mon. night. Ferocious wind, but not as bad as Iowa's tornadoes. Good idea with the lights, when it is still above freezing compared to what it will be like. Do you have the hot line buried to the new building? Yepper. going to do some wiring tommorow maybe to put a temp overhead light and switch in, and a couple recepticals so I can sparpen blades out there. Well, Tom that sure put me in the decorating mood. I decorated our yoad just like yours-----well almost. 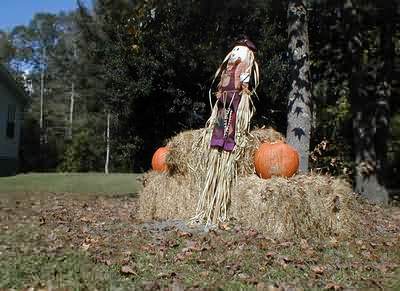 Hay is short this year, so I didn't want to put any out in the yard, and we didn't have any punkins or scarecrows. My mom is always heavily into decorating for the holidays. I don't bother because I'm alone and also I'm not big into the commercialization of holidays. However, I do appreciate the work some folks put into their decorating for the holidays. Bro Noble decorates his posts for the seasons.